A popular distillery is making its way to Music City. "Ole Smokey" is Tennessee's first legal moonshine and what began in Gatlinburg is now in Nashville. 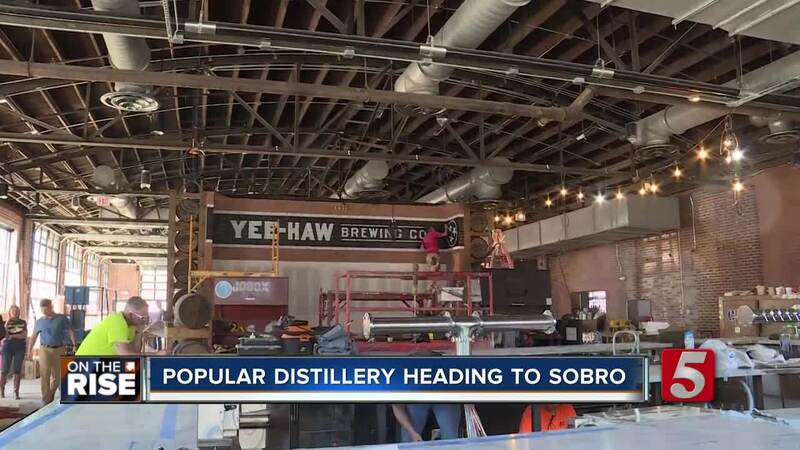 NASHVILLE, Tenn. — A popular distillery is making its way to Music City. "Ole Smoky" is Tennessee's first legal moonshine and what began in Gatlinburg is now in Nashville. "With Ole Smoky Moonshine we built a Tennessee brand that is now distributed all over the world. It just made sense to be here to be in Nashville," said founder Joe Baker. The new space is off 6th Avenue South in the SoBro area. "We’re close to Broadway but we’re just a little off Broadway. Maybe just enough to where I think we can appeal to the locals as well as the tourists," he said. When it's compete, the complex will boast a taproom, beer garden, a stage, and a giant television screen. One side of the building is dedicated to "Ole Smoky," while the other side will feature Yee-haw Brewing Co .
Justin Lowe is with Centric Architecture. He says this is one of the few buildings in the area not turning into a tower. "Kept the old steel windows, put in new glass. [We] opened up the ceiling trusses," he said. "It a great place to enjoy tacos, hot chicken, beer, good moonshine, whiskey," said Baker, "Also a place that families can be comfortable coming-in and spending some time outside with games. Everything from corn hole and bocce ball to ping-pong." Owners are hoping to get the doors open at the end of April. The distillery is now hiring. They will have a hiring event Friday, April 12 from 11 a.m. to 7 p.m. at the Fairfield Inn.